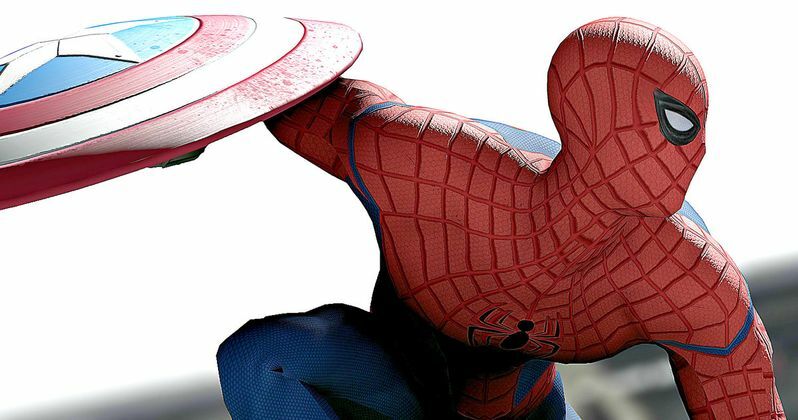 Last week, Marvel unveiled the second trailer for Captain America: Civil War, which finally gave fans their first look at Spider-Man, played by Tom Holland. This trailer was watched a whopping 100 million times in the first 24 hours, and while some were viewing this footage over and over again, one fan in particular was crafting a twisted alternate ending. YouTuber Mighty Raccoon posted a new ending to this trailer, which brings a quick demise for the web crawler. This 25-second clip shows Tony Stark (Robert Downey Jr.) calling upon Spider-Man, but shortly after he steals Captain America's (Chris Evans) shield, Spidey is put down by Hawkeye (Jeremy Renner), who fires a fatal arrow through his head. Of course, this doesn't happen in the movie, since Tom Holland will return in the stand alone Spider-Man movie produced by both Marvel and Sony Pictures, set for release on July 7, 2017. Still, it's an amusing video nonetheless, even though it won't happen on the big screen. Last year, the studio revealed that Team Iron Man includes Tony Stark (Robert Downey Jr.), Black Widow (Scarlett Johansson), Vision (Paul Bettany), War Machine (Don Cheadle) and the new character T'challa (Chadwick Boseman), who will make his debut in this movie before starring in Black Panther, set for release on February 16, 2018. Team Cap includes Captain America (Chris Evans), The Falcon (Anthony Mackie), Scarlet Witch (Elizabeth Olsen), Hawkeye (Jeremy Renner) and The Winter Soldier (Sebastian Stan), but it was never confirmed what team Spidey may be on. The trailer's final shot reveals that he's fighting for Team Iron Man, when Tony Stark calls out "Underoos," and Spidey snags Cap's shield and restrains his wrists with web shooters, before we see his costume for the first time. Marvel's Captain America: Civil War finds Steve Rogers leading the newly formed team of Avengers in their continued efforts to safeguard humanity. But after another incident involving the Avengers results in collateral damage, political pressure mounts to install a system of accountability, headed by a governing body to oversee and direct the team. The new status quo fractures the Avengers, resulting in two camps-one led by Steve Rogers and his desire for the Avengers to remain free to defend humanity without government interference, and the other following Tony Stark's surprising decision to support government oversight and accountability. Captain America: Civil War will kick off the Marvel Phase Three slate, which is jam-packed with 10 highly-anticipated movies. Following Captain America: Civil War is Doctor Strange, which is currently in production and set for release on November 4, 2016. Guardians of the Galaxy Vol. 2 is also in production, arriving in theaters on May 5, 2017, followed by Thor: Ragnarok on November 3, 2017. Black Panther hits theaters on February 16, 2018, followed by Avengers: Infinity War Part I on May 3, 2018 and Ant-Man and the Wasp on July 6, 2018. Rounding out this Phase is Captain Marvel (March 8, 2019), Avengers: Infinity War - Part II (May 3, 2019) and Inhumans (July 12, 2019). Take a look at this alternate ending for the new Captain America: Civil War trailer, along with the official trailer.